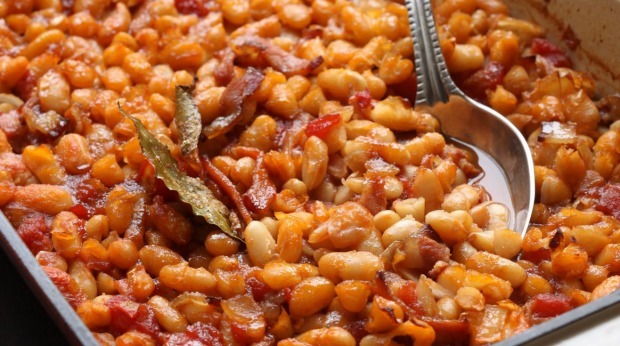 These beans are not just for breakfast, they are delicious for lunch or dinner, too. Soak beans overnight in a large bowl covered with water. Drain. Place beans in a large pot, cover with fresh water, bring to the boil and cook for about 30 minutes or until tender (the times can vary depending on the beans). Drain and set aside. Heat oven to 160C. In a large, ovenproof cast-iron dish, heat oil and saute bacon and onion for five minutes. Add tinned tomatoes, sugar, maple syrup and worcestershire sauce. Stir well. Add drained beans and bay leaf. Add two cups of water and season with salt and pepper. Cover tightly with aluminium foil, place in oven and bake for 1½ hours. Remove foil and sprinkle over raw sugar. Continue to bake, uncovered for 30 minutes.